Gerald E. Berlyn graduated from the University of Massachusetts, Lowell, in 1954 with a degree in textile engineering. From 1951 to 1964 he worked for Reed Plastics, a prominent recycling, compounding and concentrate company, where he became plant manager and then general manager. From 1955 to 1957, Berlyn served in the United States Army ordinance corps as scientific and professional personnel. He was assigned to the plastics research laboratory for the ordinance corps at Picatinny Arsenal at Dover, New Jersey. During this time, he designed and ran extrusion dies, supervised government contracts, designed, developed and manufactured missile and ammunition parts and worked on the development of the 6” atomic cannon. 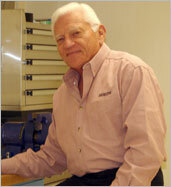 In 1962, Berlyn started Berlyn Extruders as a new machinery original equipment manufacturer. He designed, developed, and built the product line of single screw extruders up to 12” diameter, plus all of the downstream equipment required for strand and underwater pelletizing, sheet up to 108” wide, profile, and foam sheet with single and dual tandem injection systems. Berlyn also developed a line of screen changers—slide plate up to 20” diameter—and the Berlyn™ continuous filter, which is second to none. It will automatically and continuously remove impurities from the material while maintaining an absolute constant pressure drop across the melt stream. In 1964, Berlyn started a used plastics machinery company which soon became dominant in extrusion rebuilding and systems remanufacturing. Over time he expanded this business into chemical, pharmaceutical, food, and commodities machinery. This activity continues today through the business channels detailed on this web site. To contact Jerry Berlyn, click here.